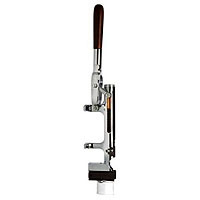 Zeus Uncorking Machine - Brass Plated, wall mount. Leverage arm measures 12" to maximize extracting power. May select three different penetration depths with two knobs at the base. Height with handle up is 22". 3" depth from wall.